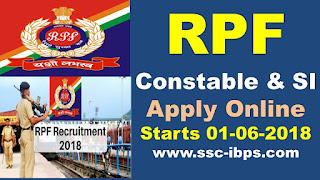 RPF Constable Apply Online: Hi Viewers welcome to ssc-ibps.com, Indian Railway Recruitment Board has invited the online application for the filling Railway Constable and Sub-Inspector Jobs in All Over India. All the candidates who are eligible and Interested aspirants can apply online at railway official websites or below we are attached the direct link for apply online. The Online application process is starts from 1st June-2018 last date for submission application is 30th June 2018. Here we are given the how to apply online, syllabus, selection process, important dates, Educational Qualification, Application fee, Age limit. Railway Recruitment Board is the Largest Recruitment Board in India. 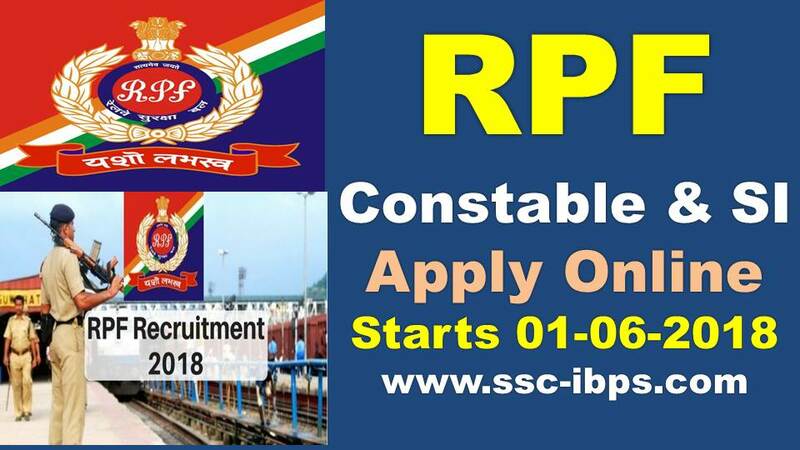 At this time RRB has released the 8619 Constable Vacancies for male and Fe-male. Below tabular from indicates the complete vacancies details. CBT Test conducted the online written exam time duration for these test is 90 minutes and total questions is 120. Questions are asked topics is General Awareness (50 Marks), Arithmetic (35 Marks), General Intelligence & reasoning (35 marks).